BBQ joints are a dime a dozen. Not only that but we own a Traeger and I can crank out some pretty decent food, if I do say so myself. When I see another BBQ food cart I usually send in my son or my husband because they can’t get enough and I have had more than enough BBQ food. So sure enough on our most recent visit to Cartlandia my husband and my son both had their eye on this cart. My son loves the pulled pork sandwiches and the sides he offered looked fabulous. Unfortunately we were there on a 90+ degree day and a few sides weren’t offered because it just made his cart too hot. Not to worry my husband jumped in and order the ribs. The food comes out and it looks good. 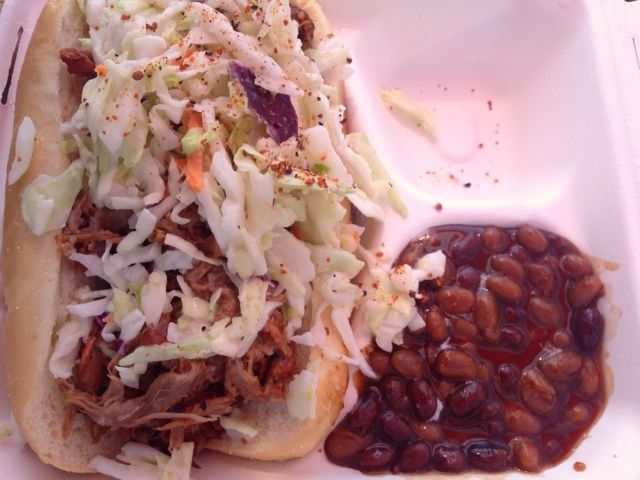 Pulled pork sandwich with coleslaw on top and a side of beans. My son digs in. He convinces me I need to try it, so I agree to one bite. Wow! This is, but it’s also NOT your typical BBQ. Often times things are so over smoked you can’t taste the meat. Other times they are over sauced and you can’t taste the meat. This pulled pork was perfectly made in my opinion. Just enough smoke and seasoning allowing the flavor of the pork to shine through. The ribs were fall off the bone tender. Easy on the smoke and seasoning giving the meat just enough flavor, yet still taste the meat. Perfect. I’ll even say it…..Better than mine. After a few questions and talking with them we found that they partake in BBQ contests all over the nation. They are a Professional Competition BBQ Team. As a matter of fact they recently came in 6th place nationwide. You understand that means they are competing with Texas?!? That’s makes 6th place pretty impressive for an Oregon Food cart. Here’s my most favorite part about the conversation. He starts telling us what other food carts we need to hit up at this pod. This is pretty typical in the Portland Food Cart scene and I love the comradery All that to say, check this guy out. He knows what he’s doing. 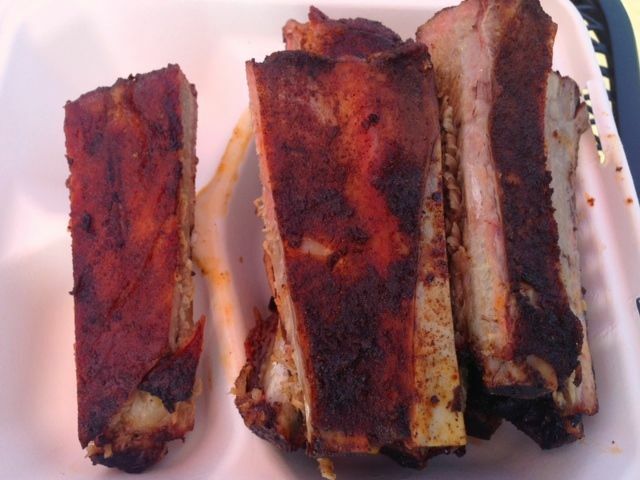 If you like BBQ you will love this. If you think they all taste the same, give this guy a shot. Da Fat Boyz BBQ also caters. They will even bring a smoker and cook it onsite. If you want they will also bring out the BBQ Meat Wagon, which is an old converted ambulance. I have not seen it, but wouldn’t that be fun? Atmosphere at Cartlandia is wide open with a huge variety. It is also on the Springwater trail, so you will see many people on bikes stop by too. 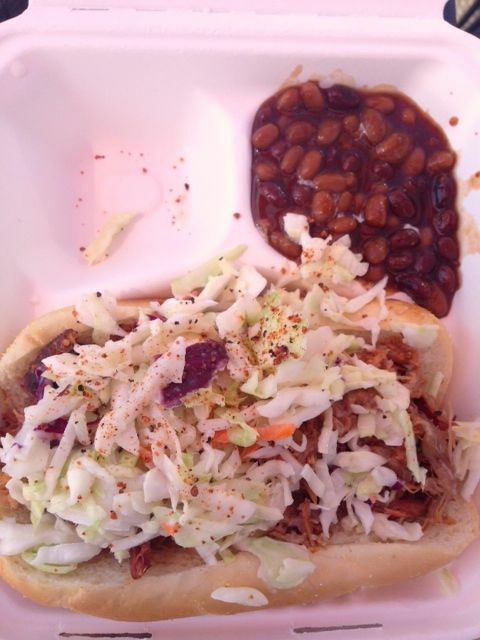 Pricing was $6 for the Pulled Pork sandwich and it came with 2 sides. Ribs were 1/2 slab for $14. Cartlania boasts a great beer garden. But don’t worry, every cart also offers drinks as well. Thai iced tea any0ne? 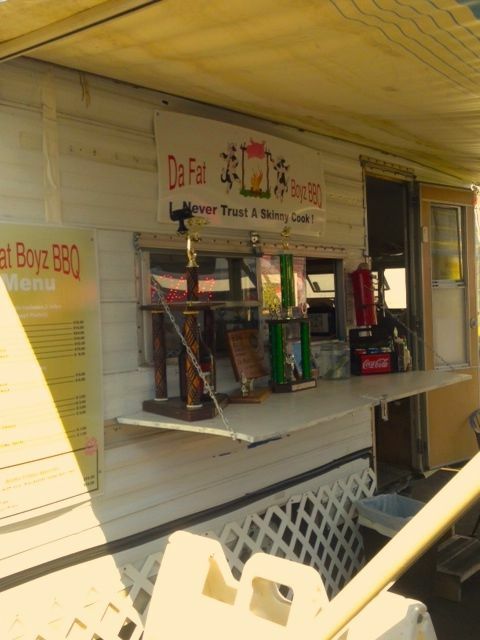 Da Fat Boyz BBQ is located in Cartlandia.